View of Brick Hill and Ocean Park across Deep Water Bay. 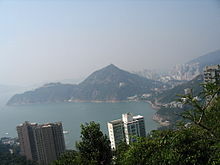 Deep Water Bay (Chinese: 深水灣) is a bay and residential area on the southern shore of Hong Kong Island in Hong Kong. The bay is surrounded by Shouson Hill, Brick Hill, Violet Hill and Middle Island. As per Forbes (July 2015), with 19 of the city's richest billionaires, it is reputed to be the "wealthiest neighborhood on earth". Beneath the hill of Violet Hill is a beach, Deep Water Bay Beach. The bay is reachable by Island Road, a road connecting Repulse Bay and Wong Chuk Hang. Deep Water Bay is the landing point for SEA-ME-WE 3, TGN-IA and TVH submarine telecommunications cables. The bay is mentioned on an early colonial map of Hong Kong 1845. Less known to tourists than the adjacent Repulse Bay, Deep Water Bay Beach is nonetheless very popular among local people. Seaview Promenade, on the east side of Deep Water Bay, connects it with Repulse Bay, the path allows joggers and walkers alike to exercise alongside the seashore while admiring the stunning sea view, while Mills & Chung Path connects Deep Water Bay with Wong Chuk Hang on the west side. Changing rooms, shower facilities and barbecue pits are available under the management of the Leisure and Cultural Services Department. Deep water bay is among the most exclusive residential areas of Hong Kong as per Forbes and Forbes Life. 19 of the city’s richest billionaires live here, with a net aggregate worth of $123 billion (as of August 2015). Its residents include property, casino, shipping and oil tycoons including Li Ka Shing, Chen Yu Tong, Joseph Lau, Robert Kuok and Lui Che Woo. All of the Kwok brothers live here and so does the e-commerce tycoon Joseph Tsai. Deep Water Bay Valley was designated a Site of Special Scientific Interest in 2008. Buses No. 6A, 6X or 260 from Central's Exchange Square, 65 from North Point Ferry, 73 from Cyberport & Aberdeen, 973 from Tsim Sha Tsui and green minibuses 40 and 52 have stops at Deep Water Bay. ^ Olsen, Robert (20 July 2015). "Deep Water Bay - The Wealthiest Neighbourhood On Earth". Forbes Life. Retrieved 29 August 2015. Wikimedia Commons has media related to Deep Water Bay.